Imported and distributed exclusively by Fratelli Camisa for over 30 years,in our opinion this is one of the finest pastas available on the market today. 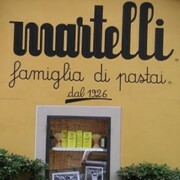 Founded in 1926 in Lari,Tuscany and run today by Dino & Mario Martelli and the Martelli family they use only the finest Canadian Durum Wheat flour which is passed through bronze dyes, making one shape per day which is then allowed to air dry naturally before being hand packed in traditional paper packets.This really is Artisan pasta at its very best. If you are lucky enough to ever find yourself in Lari be sure to look them up as they are more than happy to invite you in to watch the pasta production and if your really lucky even give you lunch.